Heat the butter in a pan until it froths. Add the coriander , cardamom and red chilli flakes and saute for 10 secs and add the chopped plums, garlic,ginger and onions and mix well with the spices. Add 1/2 cup of water and cook covered for 15 mins till the plums become soft and pulpy. Add the raisins, vinegar and sugar and cook for another 10 mins till the chutney becomes thick and glazed. Constantly stir the chutney so that it does not stick to the pan. Serve with Roti/ Parathas or any meal . Can be refrigerated and kept for a week. 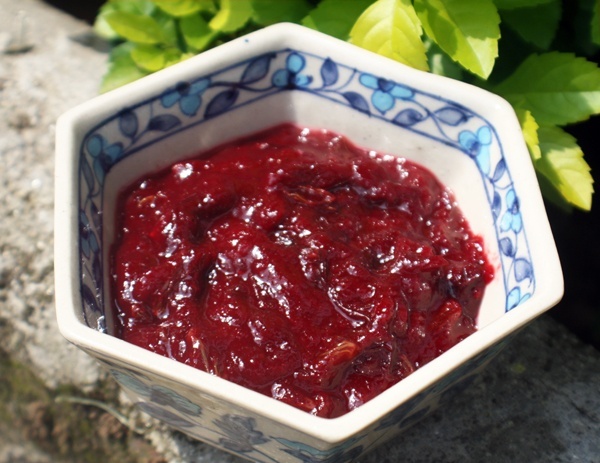 This entry was posted in Pickles & Chutneys and tagged Plum chutney by Kamakshi. Bookmark the permalink.